The truth, as a character in a play by Oscar Wilde says, is rarely pure and never simple. Actually, and here’s a lesson for us all, just because someone clever like Wilde said something that sounded amusing and smart, that doesn’t mean it’s true. In fact many truths are remarkably simple, in particular many scientific theories are actually incredibly easy to understand. Darwin’s theory of evolution by natural selection can be summarised in very few words. Random genetic variations in function that give an animal a greater chance of reproducing are more likely to be passed onto that animal’s offspring and eventually contribute to a gradual change in the overall appearance and function of the entire species. That’s all there is to it. Newton’s theory of gravitation is just as simple. It says that all objects are attracted to each other and the strength of that attraction diminishes in proportion to the square of the separation between them. That’s all there is to it. Einstein’s theories of relativity are also superficially simple, just like the basic concepts in quantum theory. Of course the maths can be horribly complicated but that doesn’t affect the simplicity of the basic ideas. But it’s not always this simple. The challenge is that not all sciences are like physics, a science of simple things. Biology, geology and psychology are all sciences of much more complex things. My own background is in psychology and despite what some people might think that doesn’t mean I can predict human behaviour in any way. In fact the greatest thing it gives me is a better understanding of how illogical, unpredictable and irrational human beings can be. Why do you think people smoke tobacco? Everyone in the world knows that around half of the people who smoke will die as a direct result of doing so. Meanwhile it’s safe to assume that every smoker wants to live as long a life as possible. How can these two things coexist? Psychologists call it “cognitive dissonance”, simultaneously having two conflicting opinions. Human beings stumble through life doing their best to reduce their cognitive dissonance, usually failing miserably. It’s perhaps one reason why consumers fall, again and again, into the same old traps. We all know that saving to buy things is the cheapest way to acquire possessions but we still sign scandalous store credit agreements that we know will cripple us. We go back to the very same stores that abused us last time, knowing they’ll just do it again. We can’t be bothered to change cellphone network providers, banks or insurance companies even when they treat us with contempt. Consumers are in a constant state of cognitive dissonance. This is a very good example of how illogical and counter-intuitive human behaviour can be. It’s not like sub-atomic particles crashing into each other which is fairly predictable, human beings are a million times more complicated. The way they behave is not always what you would predict. Everyone I’ve asked this has said that yes, of course you should. You need to confirm that your potential customer has all the information they need, that they feel confident enough to ask questions and that it builds a rapport and relationship between you and your company and the prospect. A research paper published earlier this year in the Journal of Consumer Psychology called “Inviting questions” by Uzma Khan and Zakary Tormala from Stanford University, looked at exactly this question. Does inviting questions do any good to your product and sales-pitch? The results were counter-intuitive. The researchers concluded that “merely inviting questions has a positive effect, but that this effect reverses when consumers actually ask questions.” In other words, yes, you SHOULD invite your prospective customers to ask questions but ONLY if you’re confident that they won’t actually ask any. Allowing customer to ask questions only undermines their confidence in the product you’re selling and in you. The solution is give the prospective customer enough information about the product that they don’t need to ask any questions. Your job as a salesperson (and everyone is a salesperson even if you job description doesn’t say so) is to judge what knowledge the customer needs and give it to them before they have an opportunity to ask. Your aim is to invite them to ask questions but for them to say thanks, you’ve answered them all for me already. This is a very good illustration of how psychology can be used to understand the complicated way people behave and in particular how they behave in the marketplace. Smart businesses should be keeping up with research like this to help give them an advantage against their competitors as well as the simple reward of having happier customers. But none of this matters. What does matter is my original point. If we, as consumers, are so deeply dissonant, sales techniques don’t matter. If we’re prepared to sacrifice our money, efforts and sanity in order to buy things recklessly and without thought we may as well let abusive companies do as they like. Only when we have sufficient self-worth will the science of consumer behaviour be relevant. Maybe what the psychologists of Botswana should be doing is boosting our self-esteem to a level where we think we deserve better service? I bought a Blackberry at a certain shop in Gaborone and it lasted for 3 weeks. I took it back to the shop and it has been one long battle. They claimed the software needed to be replaced but then they changed the screen of the phone with a scratched and old one and I refused to take it. I now want my money back or at least a new phone. Its been there for 3 weeks and I am stranded without a phone. What are my rights as a consumer on this issue? Your consumer rights are actually quite simple. Section 13 (1) (a) of the Consumer Protection Regulations says that you have a right to products and services that are “or merchantable quality” which the law defines as meaning “fit for the purposes for which commodities of that kind are usually purchased, as it is reasonable to expect in light of the relevant circumstances”. Section 15 (1) (a) of the same regulations also require a supplier to offer services “with reasonable care and skill”. The Regulations go on to say lots of other things that might be relevant but those are the two that matter. Your cellphone store has failed you on both of these issues and I think you’ve been patient enough. I think you should write them a letter explaining that they have breached both of these regulations and giving them 7 days to remedy the situation or you’ll be asking for support from the Consumer Protection Unit, the City Council, The Voice and Consumer Watchdog. You should also tell them that they have failed to repair the phone suitably so you will only accept either a complete refund or an entirely new phone. Let me know how they react? I bought some electronics online from china from a web site iqiodo.com. I paid and I never received my goods. After receiving my money they never responded to my emails and their online chat went down. They sent me some DHL tracking number which does not exist. Right now their website www.iqiodo.com does not exist. These guys are scammers they robbed me. Please try investigate further about them. I’m sorry but it’s too late, you’ve been scammed. The web site is indeed now offline and I don’t think you stand any chance of getting your money back. Although the site is now unavailable I took a look at an archived copy of it and although it looked normal the big clue was the prices they were offering. For instance they were offering an Apple MacBook for $640. The very same model is on sale by Amazon in the USA for $1,210, almost twice as much. I know there are bargains around if you look for them but there are no half-price MacBooks anywhere. There are comments on a variety of web sites that this site was a scam but they were well hidden by the scammers. A common practice by scammers is to post many links on the web so that when you do a Google search for something you are forced to go through pages and pages of links the scammers have created themselves. In this case I had to go through 20 pages of Google hits before I could find any hint it was a scam. The only hope would be if you’d paid them using an insured means of payment like your credit card. However let me gamble and guess that they demanded payment using Western Union? I’m sorry I can’t be more helpful in this case. The lesson for everyone else is NEVER to buy things from a site you don’t trust and NEVER to pay for any purchase using Western Union. Nobody is immune to abuse. It doesn’t matter how intelligent you consider yourself (and let’s remember that self-perceived intelligence is not correlated with actual intelligence), no matter how clever, well-educated and knowledgeable you are, you can still be fooled. He wondered how, if these people were making “good money”, I nevertheless considered it a scam. My point is this. They’re not making good money, they just think they are. 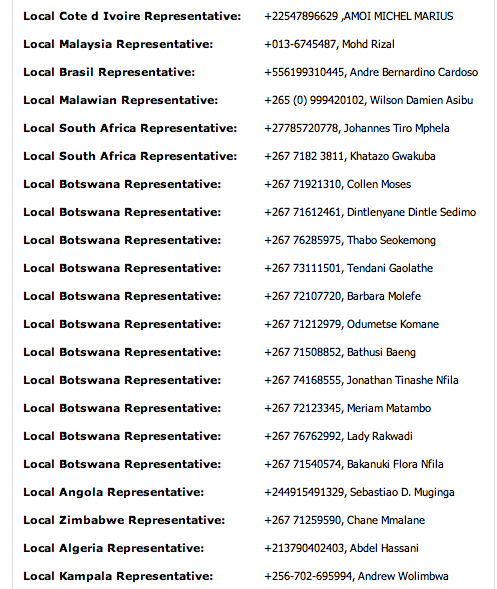 It’s certainly true that many, many people in Botswana have handed over their money, sometimes their life savings to these people. I heard from one reader who told me that most of the senior citizens in her home village had sent large amounts of money to them. You can see from my comments online why I believe it's a scam but the simplest thing is that it promises returns that are simply impossible. They claim on their web site that you can earn "Up to 2.9%" per day but we must face facts. No genuine investment or trading scheme can make that sort of profit consistently. Also, despite many people saying they are making returns, I've yet to find a single person who has actually received back, in cash, more than they "invested". In most cases the only earnings people see are online, they're not real, just figures on a web page. A web page that can easily display numbers showing what appears to be a profit but in fact are just made-up numbers. Admittedly I have also heard of a few people who have received small payments but very little compared to the initial payment they made in order to join. If they “invested” $1,000 they might have received $100 in profits but that still leaves $900 that the scammers have in their bank account. $900 that the investor won’t ever get back. Another clue is how reluctant they are to explain how they make these amazing profits. On their web site they use phrases like “short term, technical analysis based positions” and “longer term, global events driven long term profitable projections” and “in house developed trading algorithms” but that’s all rubbish, just a sequence of clever-sounding words that actually mean precisely nothing. That’s the most important thing. Why would someone invest in a scheme like this when it’s so clearly suspicious? The answer is complicated, it’s a mixture of causes. Part of it in some cases is simply greed. I would LOVE to invest $1,000 in a scheme that made 2.9% per day. By the end of a month I’d have over $2,000. After 90 days I’d have nearly $13,000. After six months I’d have $167,000. After a year I’d have $53 million. That’s why I’d be tempted to join. But what about a smart, presumably well-educated risk management expert. You’d think he’d know better, don’t you? I suggest that you go online and read an article from the Wall Street Journal entitled “How Bernie Madoff Made Smart Folks Look Dumb”. It’s about the supposedly “sophisticated investors” who threw vast amounts of money into Bernard Madoff’s remarkably unsophisticated Ponzi scheme, the ones that ended up losing a total of between $20 and $60 billion. Despite what you might think, Madoff’s victims weren’t all geriatric, confused or stupid. They were often mature, smart, well-educated people with experience in investing. The thing they all had in common, no matter who and what they were, was that they had encountered a smooth-talking salesman who persuaded them to suspend their judgment and their critical thinking skills. We’ve all been the victims of benign hard-selling, whether it’s a car salesman, a floorwalker in a furniture store urging you to buy things on credit or having things “upsold” in a bank but they’re relatively harmless. What worries me is when the salesperson sells you things that either aren’t worth the money or are based on lies. Things like holiday club memberships that you can’t ever cancel, loan sharks neglecting to tell you all the charges they’ll apply to your debt and, most worryingly, fake “investment schemes” like EurExTrade. That’s when aggressive salesmanship can wear down a smart person’s defences and leave you at their non-existent mercy. That’s why I think smart people like the risk management specialist our reader knew can fall for scams just as much as you and I can. A mixture of wishful thinking, greed and clever salesmanship combine with the worst thing of all, a lack of skepticism, to make them do silly things. The victims of EurExTrade are in this position. Any sophistication they might have had has evaporated, only to be replaced by a looming sense of abuse. I have a registered catering company and have catered for management training sessions for a company from January to March this year. We had a verbal agreement for payments to be made 30 days after service. I requested a promissory note from the Director of the company, which he wrote, acknowledging and indicating that the last payment would be made by the end of July. The last but one payment was made in August after numerous calls and pestering. They now have an outstanding balance of over P8,000 to date. I want my dues please help! Firstly I think this teaches us a lesson about verbal agreements. Don’t make them. In business things like this are ALWAYS put in writing. Verbal agreement are only for your most trusted friends and family. I think you’ve been patient enough. You are owed a large amount of money by someone who has also acknowledged his debt in writing. It should be simple enough. I suggest that you write the Director a simple letter saying that unless he honors his debt to you in full within seven days you’ll be seeking an order from the Small Claims Court. Tell him that once you have that order you’ll be taking immediate action to get your money back. Please let me know how he responds! I was called recently by a hotel chain in South Africa offering me membership of their scheme that they say give me big discounts on hotel stays. Do you think I should join or is it a waste of money? My opinion is simple. These schemes simply aren’t worth the joining fee, which is often more than P2,000. To begin with the discounts they offer aren’t real discounts. They’re only discounted from the full rate that the hotels publish but there are many other ways of getting discounts without paying to join clubs or schemes. For instance you can go to www.bid2stay.co.za and get significant discounts entirely for free. Then there’s the slightly shady way many of them operate. We’ve heard from many readers who get these calls and are suckered into disclosing their card details, often being told that it’s just to check their status or whether they qualify for higher-level membership. Before they know it, and without their permission, their account is charged the full membership fee. What’s worse is that like many holiday club schemes it’s then almost impossible to cancel your membership. Holiday clubs in particular often have a non-cancellation clause in their contract. You’re stuck with them for life. My suggestion is simple. Don’t join any scheme like these unless you are absolutely clear what you get for your money and that you can change your mind whenever you please. The BMW M3 that was offered. 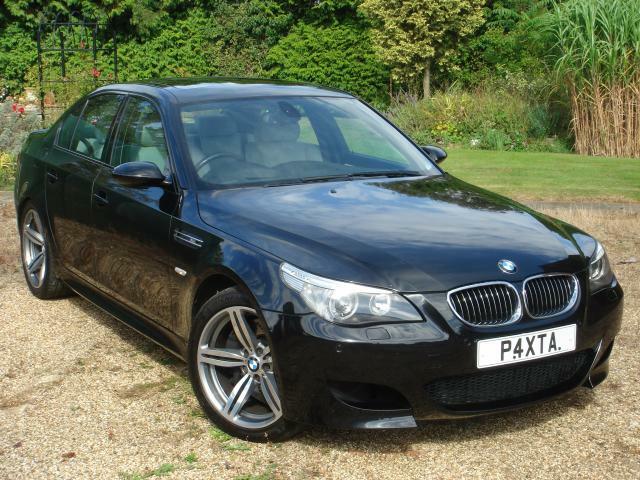 We heard from a reader who had been offered a car at a remarkably good price. The seller, who called himself “Albert Camron”, claimed that he had moved from Botswana to Benin and taken his 2006 BMW M5 with him. He said that the “constitution here does not allow the Right Hand Drive car, that is a problem that I have so I decided to give the car away to anybody who can ship the car back to Botswana and take care of it well.” He went on to say that he was “giving it away on donation”. According to the seller he’d transported the car to his new home in Benin for P16,000 and it would cost another P22,000 to transport it back to Botswana. That’s all he wanted for the car, to have his transport costs reimbursed. Do you suspect a scam yet? I do. The transport company he said the victim should pay doesn’t actually exist and has been used in other scams before. There is no trace of an Albert Camron living in Botswana. Total strangers don’t “donate” BMW M5s. They just don’t. This is a scam, you’ve been warned! Update: Here's another picture of a BMW M5, taken from the web site of Ivel Car Sales Ltd in the UK. What a coincidence! It’s been a busy few weeks for us. Of course a lot of it has revolved around exposing scams. Nothing new there but scammers are evolving, they’re smart people and adapt to exploit public gullibility. A reader received an email after she posted her details on various job-seeking web sites. Someone calling himself “Michael Lincoln” got in touch, saying he worked for a company called “i-to-i Volunteering”. He offered her a job in Costa Rica, volunteering her services in an orphanage, but paying her a massive $770 per week. She wondered whether this could be true? What do you think? Are volunteers offering their time in orphanages in Costa Rica, admittedly a fairly wealthy country in Central America, really paid the equivalent of P300,000 per year? No, of course they’re not. It didn’t take too much work to realise that this was a scam. The clues were there in the email he sent her. Instead of using their real email domains, "i-to-itravel.com" and "i-to-i.com" his address ended in “worker.com”. There’s the first clue. The phone numbers in his email also weren’t the real ones belonging to the company, in fact the only one that worked was a UK-based cellphone number, one of those redirectable ones that could, in fact, be anywhere in the world. Finally there’s that business about being a volunteer but earning more than a bank manager. Then there was the clincher. I spoke to the real “i-to-i Volunteering” and they’d heard about this crook already. Several people had been in touch with them to ask whether he was genuine. He wasn’t. It encouraged anyone who had NOT done so to click on a link in the email. Think about the manipulation in that email. Assuming that you have an American Express (or indeed any other card), how would you react to an email suggesting that someone other than you had recently changed your online password? You’d probably panic. Without thinking too carefully you’d click on the link and be presented with a web page looking just like your real online banking sign-on screen. Almost inevitably you’d enter your username and password, not noticing that the web site you were actually visiting was not the one you expected. Even if you noticed quite quickly it would be too late. Your banking username and password would be held in a database of potential victims by a scammer in some far-flung part of the world. Before you knew it your account would be empty. The worse news is that if you complained to your bank they would be perfectly entitled to tell you that it wasn’t their fault, it was you that gave away your details. It would be YOUR problem, your loss. In case you don’t know already the lesson is simple. Real banks never, I mean NEVER, ask you to click on links in emails that they send you. In the unlikely event that a real bank does ever did do that you should close all of your accounts the same day. They can’t be trusted with your money. It was also more of the same with fake degrees. We’ve had a series of discreet enquiries from people concerned about the degrees their colleagues or even bosses claim to have. Are they genuine degrees and are they genuine universities? Someone recently asked us about a colleague with a doctorate from Rochville “University” a well-known diploma mill. As with all the others I went to their web site and had an online chat with one of their “advisors”. My opening question was “how quickly I can get a degree from Rochville University?” The answer was simple. Without asking me about my experience or my prior qualifications he replied “in 10 to 12 days”. We all know that such a degree is fake, don’t we? Like we know that anyone with such a degree is a fake as well? However the biggest single subject about which people have asked for advice has been the EurExTrade scam. This is a Ponzi scheme. EurExTrade just take taking some of the “investment” you make to pay the person who joined last week. There’s no actual investment happening, they’re just “robbing Peter to pay Paul”. Sooner or later all Ponzi schemes collapse when they can’t find any new victims to pay the investors higher up the ladder. That’s when there’s a domino effect when everyone tries to withdraw money that no longer actually exists. My biggest worry is that this particular scheme is focussed predominantly on Botswana. 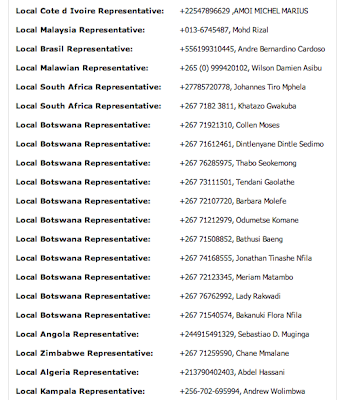 Almost half of all the contacts given by EurExTrade on their web site have phone numbers starting with +267. Why us? Why are we so special? Or perhaps I should ask why are we so gullible? I heard from someone recently who told me that all of the senior citizens in her home village had transferred their savings to EurExTrade. Nobody has had the courage yet to tell them that they will never see that money again. They are destined for an old age in poverty as a result. Nobody has yet caught the thief who recruited them and encouraged them to throw their money away. Probably because they know him or her. EurExTrade pay up to 10% commission to people who recruit other victims so the recruiter has an interest in stealing other people’s money. The lesson of course is the same. All of these scams and deceptions can easily be beaten by a small dose of skepticism. However there’s clearly not nearly enough of it. I took my laundry for wash on the 22 Sept and was informed by the assistant that I should come for them the next day, only to get there and find another assistant who instead of giving me the clothes asked me to come nearer to the 2 laundry baskets. One had pink stained clothes and the other one had clothes not washed at all. I didn't loose it then since I assumed we all sometimes make mistakes. They gave me an assurance that they will be rewashed with a stain remover detergent. When I came for them about three days later some were still stained pink. Again I held my temper and patience but insisted that I be compensated for the loss of the two garments. What makes me lose patience is that I have been promised a cheque in compensation for the value of the two items but I don’t hear from the laundromat unless I call to enquire and only to be told of excuses of the boss's absentia and that upon his presence in office I will be contacted. I never receive any calls and it makes me wonder what kind of service and remorse it is! Please help. I think you’ve been remarkably patient. You understood that, as you say, “we all sometimes make mistakes” and you gave them the chance to remedy the problem. The good news is that they’ve promised to compensate you. They seem to understand that they have an obligation to do so. 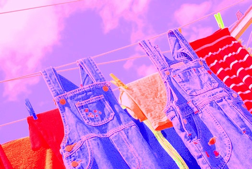 I suggest that you write them a letter giving them another 7 days, either to give you back your clothes in good condition or a payment for their value. You should mention that Section 15 (1) (a) of the Consumer Protection Regulations requires them to deliver services “with reasonable care and skill”. In your letter you should make it clear that you’ve consulted us and that if they fail to respond suitably you’ll be seeking the help of the Small Claim Court. Please let me know how they react? I went to check my balance at a local bank and was surprised to find out there was a debit order that I did not know about. P3000 was debited from my account and I did not authorise it. I never made any debit order and I made it clear to them. The bank said I should find out for myself where the money went. I don't even know how to trace it. They gave me the account number it was debited to but I don't know which bank that account belongs to. They said maybe its a policy but I told them I haven't signed any policy. If this is correct then your bank are deeply silly. In these circumstances it is ENTIRELY the responsibility of the bank to discover what’s going on. You have, I hope, made it clear to them that this is a suspicious, perhaps even criminal transaction and they should be running around furiously trying to find out what’s gone wrong. Saying that it’s your job to do all the detective work is absurd. I’ve sent your problem through to the bank concerned and asked them to investigate urgently. You should do the same and you have a right to expect a daily update from them on progress. I know that some banks charge customers for this sort of investigation if it turns out in the end that it WAS the customer that authorized it but however this ends up you have a right to an investigation and a solution. The important lesson from this is for all customers to regularly check their bank balances. These days with internet and cellphone banking and ATMs everywhere it should be fairly easy. Let me know what you from them! We’ve received a number of emails entitled “Corporate eFax message - 2 pages” and I’ve heard from other people who’ve received exactly the same thing. 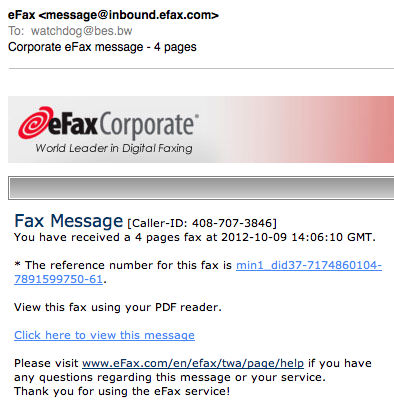 The message suggests that you’ve received “a 2 pages fax” and you should click on a link to view it. Please don’t. 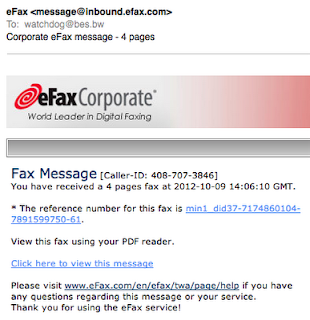 The links in the emails are nothing to do with faxes. They’re the beginning of some suspicious. It could be a “phishing” attack that will attempt to persuade you to give away passwords or a source of computer viruses and malware. Either way you’ll be exposing yourself to danger. Don’t click on links in email from people you don’t know. And invest in protection for your computer. I just recently took my shoe to be fixed at a shop at Riverwalk in Gaborone. This shoe was taken in on the 4th of August and the people in the shop have since then misplaced it. 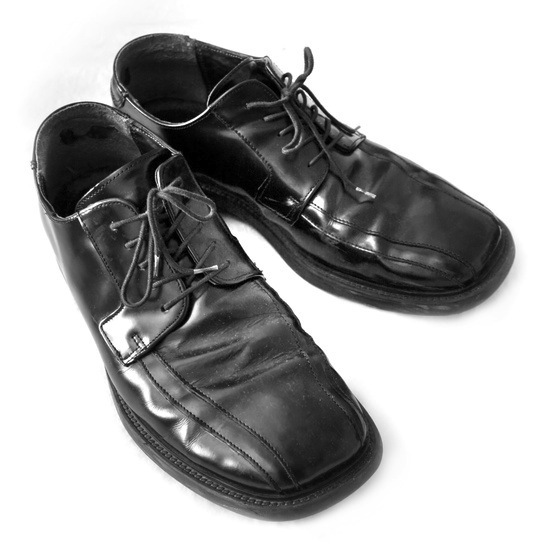 I had been battling with the manager of the shop for over a month for him to look for my shoe or to give me a solution if he could not find it. The phone call I had with him this morning was not good he kept telling me that he doesn't know where the shoe is and that I am harassing him for asking for my shoe. He went on to tell me that he is protected by a law and that he is not liable for the whereabouts of it and that I should stop calling him. Now this gets me to think that does this mean now that they treat all their customers like this or is it because of the fact that I’m younger than him. I feel as a customer I have been mistreated and am being thrown around. Please assist me in this matter. I have given him more than enough time to give me an answer and it has been a month and a half or so. I’m sorry for the trouble you’ve had with this store. You have indeed been mistreated and you deserver better that to be told the law protects them rather than you. I think that you should write the store a letter demanding that they fix the issue, either by returning the shoe to you or by compensating you for your loss within a suitable time. Perhaps give them seven days to fix things. I suggest that you tell them that if they don’t fix it you’ll be approaching the Small Claims Court for help. You should remind them that one shoe is no use to anyone apart from someone with only one leg. I assume you have two? If they can’t find the shoe you need the price of a new PAIR, not just the one they lost. You might also remind them that Section 15 (1) (a) of the Consumer Protection Regulations requires stores to deliver services “with reasonable care and skill”, something they’ve clearly failed to do in your case. Please let me know how they respond? I stayed at a hotel [name withheld] on 10 August 2012 and checked out on 12 August 2012. At the time of checking in I gave them my debit card and P2,000 was withheld on my account. Before I checked out, I lost my debit card before settling and settled my bill in cash instead. The staff at the hotel assured me that the withheld P2,000 will be released to my account in 7 days. Its now over 1 month and the money is still withheld. I have written to my bank and to the hotel but have received no assistance. Can you assist? This is too much. It should be a fairly simple thing for the hotel to reverse the hold they have on the money in your account. I can understand that the hotel’s bank and yours probably need to talk to each other and perhaps fill in a form to confirm it’s genuine but this shouldn’t be so difficult. It must also be something that happens fairly often in a hotel like this one (it’s a big one that every reader will know)? It’s not going to be the first time this has happened. I suggest that you write to the hotel and ask them when you can expect your money to be released. You should also copy the letter to your bank so they understand the situation. I’ve contacted them as well to let them know they need to get moving. Let me know if you hear from them? Update: I heard back from the reader who had just heard from the hotel and the bank that the withheld money was about to be released. However they told him that this normally takes 45 days to process. That’s just ridiculous. I don’t care about the bureaucracy, this is 2012, get it done! 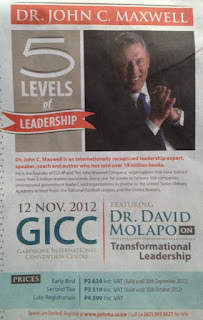 The papers have advertisements for a forthcoming visitor to Botswana, the hugely esteemed Dr John C Maxwell. 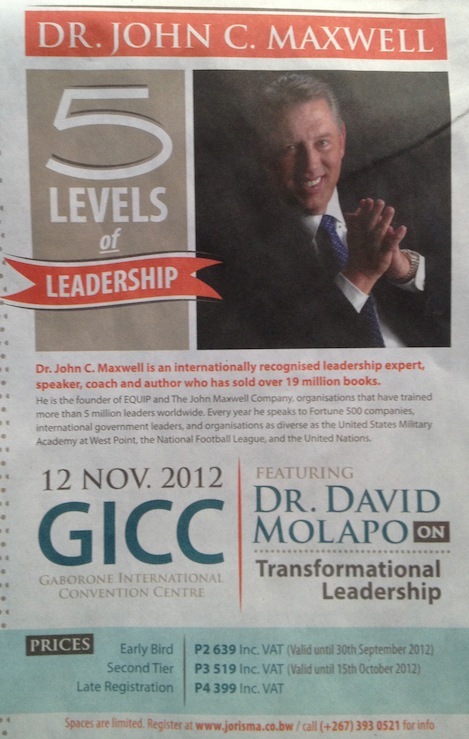 He'll be offering "5 Levels of Leadership" at a conference at the Gaborone International Conference Centre. Maybe he's qualified to do that because apparently he's sold over 19 million books. It's worth reflecting on the "Dr" part though. His doctorate is Doctor of Ministry degree from Fuller Theological Seminary. He's doctorate is in Religion, not in Business, just like his Bachelors and Masters degrees. But maybe the 19 million books qualify him instead? Actually if you look closely and read a little between the lines, I suspect that much of the writing is actually done by his "Book Writing Partner", Charlie Wetzel. "Dr. David holds an Associates Degree in Math and Science, Bachelors in Education from Oakwood University, Masters in Education from Oral Roberts University, Doctorate in Religious Education from International Seminary." Oakwood University is a private university run by the Seventh-day Adventist Church. Oral Roberts University is rather more complex. It's certainly a recognised university, but only if you count rather controversial religious and bigoted establishments as "recognised". My favorite though is "International Seminary". This is a non-accredited establishment of higher learning. Doctorates from this place are as recognized as doctorates written by me on a beer mat after a few drinks. As always I'm not going to tell you whether you should or shouldn't attend Dr Maxwell's and MR Molapo's conference. If you really want to spend P3,000 on a day's uplifting hogwash that's entirely your business. Just know who's going to be spouting the hogwash. Then decide.